Corner Store Technologies Pvt Ltd, a full-service pharmacy targeting patients with chronic illnesses that operates under the brand LifCare, has raised $1 million (around Rs 6.6 crore) in angel funding led by investor Rajul Garg. Other investors who participated in this round include Kunal Shah, chief executive officer of Freecharge; Sandeep Tandon, co-founder of Freecharge; Dheeraj Jain, partner at UK-based hedge fund Redcliffe Capital; Mohan Lakhamraju, former managing director of venture capital firm Tiger Global; Rishi Mandawat, principal at private equity firm Bain Capital and Alok Mittal, former managing director of venture capital firm Cannan Partners. Investors from Dexter Angel Circle, a group of angel investors built around Dexter Capital's partners and team with interest in investing in early stage businesses, also participated in the funding round. Dexter Capital was the adviser to LifCare on the funding. LifCare, which was launched in 2015, will use the funds to expand its presence in Jaipur, enter a couple of other cities in the next three to four months, upgrade its technology and hire more people, co-founder Krishna Killa said in a statement. It currently has a team of about 40 people. 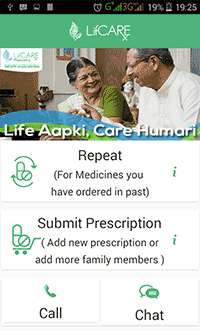 The company was founded by Krishna Killa, a former associate at Bain Capital; Rohit Mohta, a former executive with pharma company Cipla and Deepesh Rajpal, a former executive of Wipro Ltd.
LifCare delivers only medicines meant for chronic illnesses to customers who take these medicines regularly. Customers have to register with LifCare once with their medicine list and prescriptions. The pharmacists then manage everything from proactive refills to making sure adherence ratios are maintained to educating patients on how to better manage their chronic diseases. It has more than 5000 patients who have subscribed to LifCare's services. LifCare has a pharmacist licence and procures medicines from distributors. Killa said that LifCare is not an online pharmacy that sells medicines across segments. "We are more like a chronic care pharmacy than an online pharmacy like Caremark in the US which is a standard business there. This segment is missing in India so we started it," Killa said. LifCare also sends its pharmacist to the customer’s house who verifies the prescription of the doctor. The medicines are delivered by the delivery boys employed by the company.